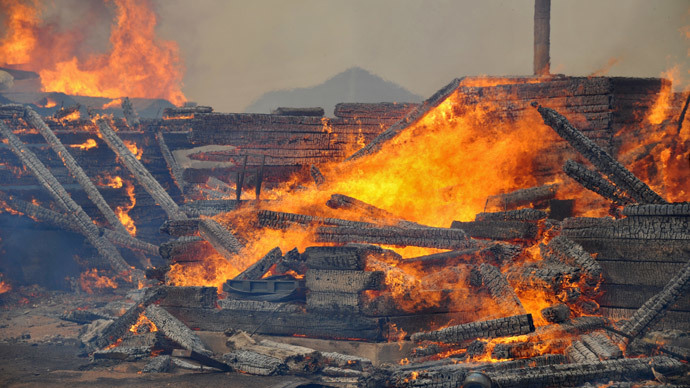 The massive fires that swept through nearly 60 villages and towns in the Siberian republic of Khakassia have left 23 people dead, and more than 900 injured, according to an official committee investigating the tragedy. “Currently the committee can confirm 23 deaths,” head of the investigative committee Vladimir Markin was quoted as saying by TASS. More than 1,400 homes were destroyed in the fire, leaving some 6,000 people homeless, according to regional governor Viktor Zimin. Those who suffered severe injuries from the fire were delivered to Krasnoyarsk for treatment. Russian President Vladimir Putin had personally coordinated emergency services operations in Khakassia, according to his spokesperson. Some 5,000 firefighters as well as thousands of volunteers worked to contain the blazes through the night, extinguishing the fires by Monday morning. Temporary camps have been set up in the Beisky and Shirinksy districts nearby for those displaced by the fire. Five criminal cases have been opened by the Investigative Committee of the Russian Federation following the fires in Khakassia that led to the death of the civilians, spokesman Vladimir Markin announced. The Russian Emergencies Ministry meanwhile announced that it will be sending humanitarian aid to the regions which have suffered the most. The fires started after mass grass burning by residents in the region. Grass burning is a springtime tradition among farmers in some parts of Russia, meant to clear the fields of dry grass and prepare them for planting.